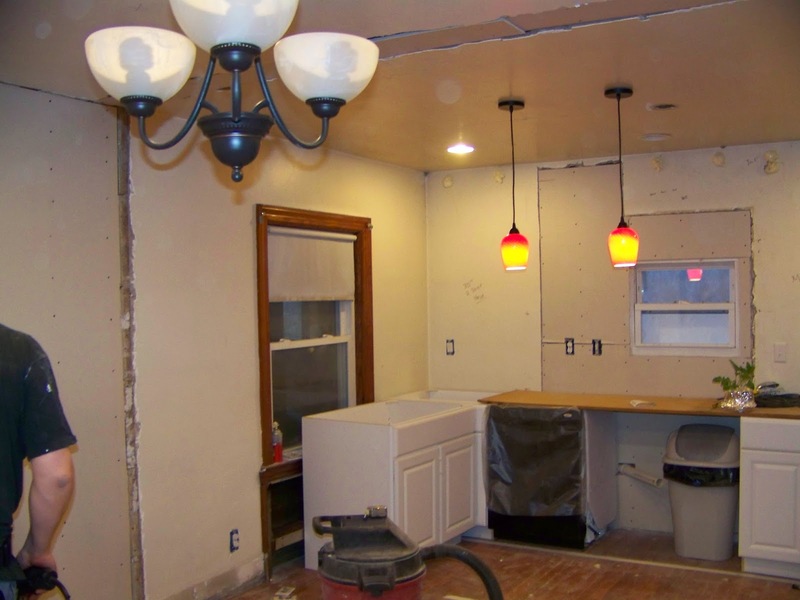 Over the past few weeks we have shown you what the Kitchen and Dining room looked like in our first house, how we demolished it, and started to build it back up. Today, we put on the finishing touches and show some before / after pics. It is always important to do a good dry-fit of your base cabinets, and to test out how the doors open/close so that any last minute adjustments can be made. You can also see the lighting upgrades and the holes in the wall were for blowing insulation. For the upper Cabinets, we installed back braces to make attaching the crown easier down the road, and made sure that the electrical and vent for the fan all came together. At this point we needed to get that floor finished, so we made our first unforgivable mistake in this renovation. 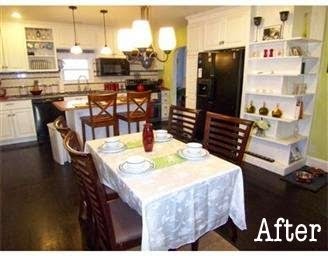 We really liked the idea of dark, rich color, so we really slathered that stain on. As we now know, this was an impossibly foolish thing to do, since the stain layer was too thick. This meant that the polyurethane adheared to a weak layer, and within a year we started to have parts peel up. Long story short: stain needs MANY light coats, with a good wipe in between if you want to get this color! The chimney was nicely incorporated into the room by building a custom bookshelf around it. This design was a lot of fun to put together, and continues to be one of the features we are most proud of in this room. Note that the shelves are continuous even though they are "L" shaped, and that the support for that exterior corner alternates as you work your way up the bookshelf. 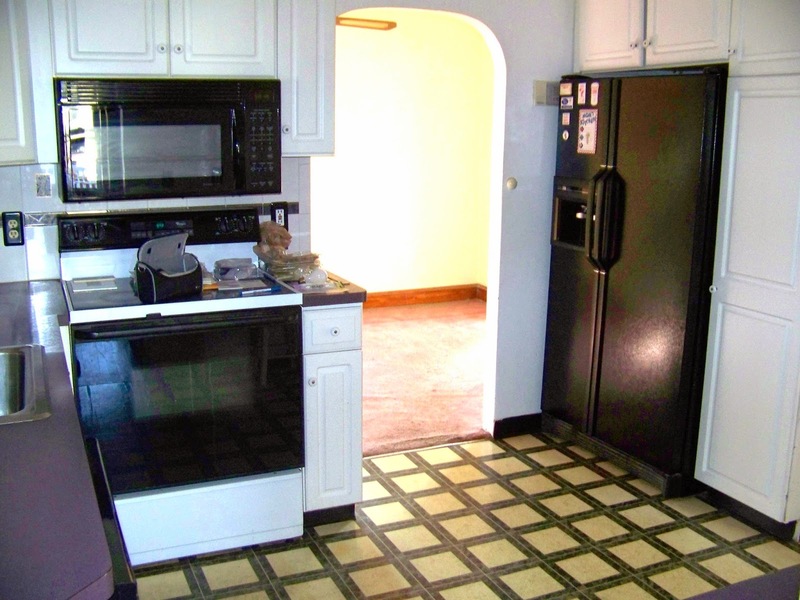 The also fit in nicely next to the refrigerator to continue the built-in look. The kitchen was now really taking shape. It may look like we forgot one of the upper cabinets, but this was very intentional because we had big plans for that space. Kidding!! Even though Madeline is the perfect accessory and was surprisingly agreeable to this space, it was actually our intention to build a custom dish rack for our most used plates. Also notice the backspash which Cassandra installed with painstaking detail, and the crown molding which really gives the space a finished feel. You can also see the bucher-block island that we installed. The drawers for this were actually re-purposed from an old dresser that the previous owners left in the basement. Converting it to an island-base should have been easy, but while the drawers were from the other dresser, we built the base ourselves (with my dad's help!). This meant cutting many small narrow pieces out of plywood, and after cutting 100 of them perfectly, while doing the very last one my thumb got bit by the table-saw. I recovered, and that thumb is healthy enough today to endure more abuse, but it was not a good thing, and a cautionary tail to this day! Take a second to look at all the fantastic details in this kitchen!! This was an amazing project, and while thinking about all the work it took makes me wonder how we ever had enough energy to do a project like this (a recurrent feeling these days . . .), we learned so much from the experience that I am so grateful that we were naive enough to attempt this.